What Features Do Good Work Boots or Shoes Have? Choosing the right work boots or shoes can make a tough job easier. When your feet are comfortable, it is easier to work long hours and face treacherous conditions. Budget is always something to keep in mind but should not be the final deciding factor. Getting quality boots might mean making a small investment. Keep in mind these boots will also be facing a long day at work. Work shoes should protect your feet and help you combat fatigue. These are some of the main features to consider when shopping for work shoes or boots. Durability is crucial to ensure the boots stand up to ongoing wear and tear. From harsh terrain to rain, the right boots can take it. Quality leather with textile or rubber outsoles is a smart choice. Work shoes should have inner cushioning and a moldable insole that will conform to the shape of your feet. Plus, the inside of the boot needs a spacious interior that does not squeeze your toes and foot to minimize strain and blistering. A shock absorbent boot makes it easier to move and jump. Consider boots with a steel toe or add this feature to a cheaper boot. The right lacing keeps the boots securely on your feet and gives the wearer greater comfort. If the boot is loose, it will slide and could cause accidents. 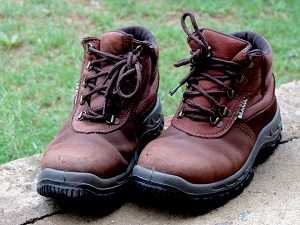 Look for secure laces that are the proper length for the boot. Certain work shoe brands are familiar to everyone, even if they do not work in the construction industry. There are reasons why these brands are popular. Brands such as Timberland and Wolverine have stood the test of time. These rugged work shoes offer the support and durability builders need. Other viable brands include Thorogood, Ariat, and Red Wing. For generations, builders and farmers have worn Timberland work shoes and boots. They are useful for multiple work situations and are easy to break in. Typically, wearers enjoy years of use. As a result, Timberland work shoes are worth the initial investment. The work shoes are often a light color that darkens with use and exposure the outdoor elements. Some have antimicrobial properties to reduce odor and irritation. Choose from insulated and non-insulated Timberland work shoes. Steve Owen from ShoeCast writes that his team reached out to few people that like these boots and most of them "love the comfort that it provides and the multiple years’ worth of use that they have gotten from the boots and this will certainly ensure that you get quality and value for your money." Often Timberlands are water resistant, which means mud can be easily wiped away with a cloth. The insoles are comfortable and mold to the wearer's foot. They come in various ankle shaft sizes. A shorter shaft is good for moving around. Choose from boots with an alloy safety toe or a soft toe, based on your needs and preferences. Many also have a slip resistant design for sure footing. Timberland boots to consider are the Timberland PRO Men's Boondock 6” Waterproof Non-Insulated Work Boot and the Timberland PRO Men's Pitboss 6” Soft-Toe Boot. While Timberland can be worn for all purposes, Wolverine is well-known as the best work shoe for construction workers. It is constructed from important leather with a high-quality feel. The arch is supportive, which reduces the stress on your feet. Construction workers, farmers, and miners all rely on Wolverine boots for comfort in a grueling physical work environment. Plus, Wolverine boots feature an easy to use lacing system that provides additional support. The soft and moldable insole makes these boots feel like slippers. The rubber soles have a convenient non-slip feature to stick to almost any surface. Wolverine works shoes to check out include Raiders and Legend. Thorogood work shoes are ideal for concrete workers. These boots are specifically designed for construction and farming. The offer value with quality construction including imported leather and stitching did in the US. They also have a stylish look that molds to your feet within a few days. Red Wing Heritage Men's Blacksmith-M work boots are as comfortable as the are durable. Much like the majority of Timberland work shoes, these boots are multi-purpose. The Vibram sole stands up to the test of time. These round-toed boots are attractive enough to wear with business apparel. Irish Setter work shoes are designed for people who work in an oily construction environment to reduce potential slipping. Ariat makes a pull-on H20 Work Boot called the Workhog. It is designed for optimum comfort with a smart Western design. These waterproof boots can protect you from moisture and snow. The platform design and stability provided b this boot reduce foot fatigue and help take pressure off your back. Take time to research work shoes and boots to make the wisest decision. Keep in mind comfort, durability, and budget as you make a final choice. After all, these boots will become a daily work partner you need to depend on.